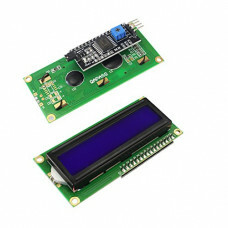 This is LCD 1602 Parallel LCD Display that provides a simple and cost-effective solution for adding a 16×2 White on Liquid Crystal Display into your project. The display is 16 character by 2 line display has a very clear and high contrast white text upon a blue background/backlight. This is great blue backlight LCD display. It is fantastic for Arduino based project. This LCD1602 LCD Display is very easy to interface with Arduino or Other Microcontrollers. This display overcomes the drawback of LCD 1602 Parallel LCD Display in which you’ll waste about 8 Pins on your Arduino for the display to get working. Luckily in this product, an I2C adapter is directly soldered right onto the pins of the display. So all you need to connect are the I2C pins, which shows a good library and little of coding. The I2C is a type of serial bus developed by Philips, which uses two bidirectional lines, called SDA (Serial Data Line) and SCL (Serial Clock Line). Both must be connected via pulled-up resistors. The usage voltages are standard as 5V and 3.3V. If you already have the I2C adapter soldered onto the board like in this product, the wiring is quite easy. You should usually have only four pins to hook up. VCC and GND of course. The LCD display works with 5 Volts. So we go for the 5V Pin. The values shown on the display can be either a simple text or numerical values read by the sensors, such as temperature or pressure, or even the number of cycles that the Arduino is performing. I2C Reduces the overall wirings. Single LED backlight included can be dimmed easily with a resistor or PWM.